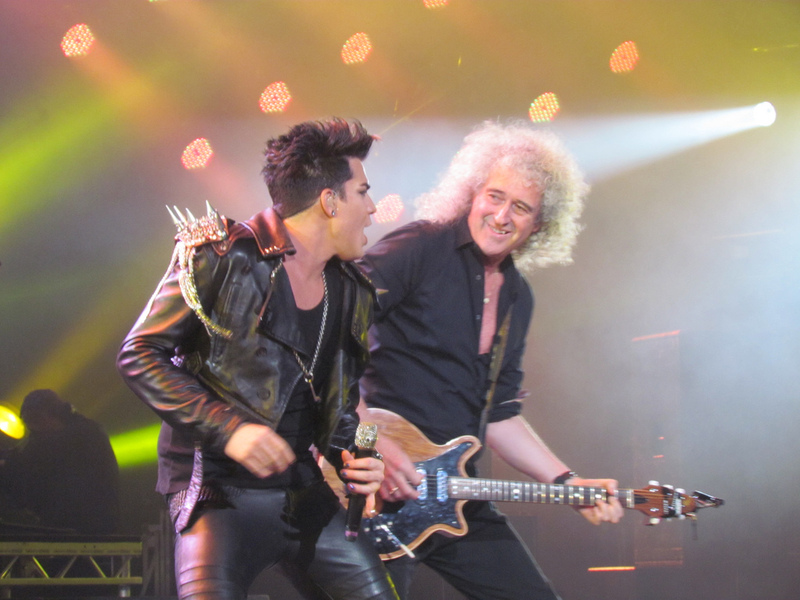 Brian May Gives Adam Lambert a Whole Lotta Love! You are here: Home / Tours and Live Performances / 2015 Queenbert / Brian May Gives Adam Lambert a Whole Lotta Love! Who says that Brian May and Queen haven’t been closely checking out Adam Lambert’s career? In this video shot in Prague on February 17th, Brian gives Adam another confirmation of his respect. Adam gets a total kick out of the Whole Lotta Love riff! Wouldn’t it be exciting to see Queen add some of Adam’s favorites or even his own songs into their playlist? The tour is wrapping up next week, but what if the band got together again in a couple of years after Adam releases The Original High and gives a dazzling solo world tour?! I can see Brian, Roger and Adam continuing on and on, can’t you? But without new material, how many set lists of Queen’s catalog can they do? I’d love to see them bring in some of Adam’s songs or even throw in some of all of their favorite covers, like Whole Lotta Love? Wouldn’t that be a nice slap in RCA’s face?! Thank you Lilybop for posting this video. I encourage you to check out Ivka Plo’s longer concert video that this clip was taken from (at 4:25) here. The I Want It All intro sounds like the Fantasy Springs’ version of Whole Lotta Love. Another example of Queen following Adam! Yes I agree. I actually hope they schedule a few other countries like South America for Adam and Queen and he can still tour with his album. It’s probably likely that radio will snub Adam so I’m not sure how much of a tour he can afford. My other fantasy is when Queen and Adam don’t do Queen anymore, Brian and Roger or Rufus, and maybe even Spike Edney could play with Adam for his music. That would be total respect. Brian May has toured with other unknown artists. He loves touring. Man, I wish they would’ve followed through and let him sing it!!! Adam Is a hoot! He can be funny, sweet, adorable! He is just amazing! I love you Adam Lambert! Me too. It would be great to see Adam do a few of his songs in the show. I hope they do another round in the US this year.